4. 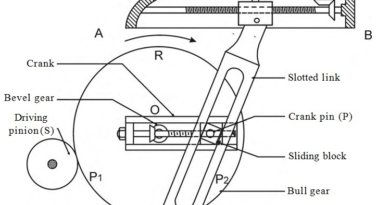 The arc of contact between the belt and the smaller pulley. 5. Types of belt drive used. There are many size and shapes belts used in power transmission but today we are describe the mostly used belts. This belt is mostly used in the factories and workshops, where a moderate amount of power is to be transmitted, from one pulley to another when the two pulleys are not more than eight meters apart. 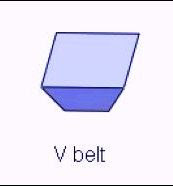 The V-belt as shown in figure is mostly used in the factories and workshops where a moderate amount of power is to be transmitted form one pulley to another, when the two pulleys are very near to each other. The circular belt or rope as shown is mostly used in the factories and workshops, where a great amount of power is to be transmitted, from one pulley to another, when the two pulleys are more than eight meters apart. These belts are used for power or motion transmission with accurate timing. These belts have toothed surface with meshed with the pulley so it is not a ordinary belt works on friction. This belts required special type of pulley so it is most expensive belt. This is used to obtain accurate timing. The material used for belts and ropes must be strong and flexible and should have high coefficient of friction to provide higher efficiency. So the belts material plays a major role in power transmission. According the belt material is classified as follow. This are the most important belt used in workshops. It is made by 1.2 meter to 1.5 meters long strips cut from either side of the bhack bone of the top grade steer hides. The hair side of lather is more smoother and harder than the flesh side but the flesh side is interwoven and parallel to the surface. The leather may be either oak-tanned or mineral salt tanned. To increase the thickness of belts, the strips are cemented together. 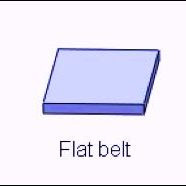 According to this the belt are designate by the numbers of layers, single ply, double ply etc. Canvass or cotton duck are used in the fabric belts. These belts are made by three or more layer stitching together. These belts are woven also into a strip of the desired width and thickness. These belts are impregnated with some filler like linseed oil in order to make belts water proof and to prevent injury to the fibers. The cotton belts are suitable in warm climates, in damp atmospheres and in exposed positions. Since cotton belts require little attention, therefore these belts are used in farm machinery, belt conveyor etc. 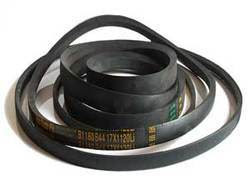 The rubber belts are made of layers of fabric impregnated with rubber composition and have a thin layer of rubber on the faces. These belts are very flexible but the quickly destroyed if allowed to come into contact with heat, oil and grease. The rubber has elastic quality so these belts are easily made endless. These belts are found suitable for saw mills, paper mills where they are exposed to moisture. 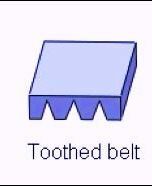 These belts are similar to rubber belts except that balata gum is used in place of rubber. These belts are acid proof and water proof and it is not effected by animal oils or alkalies. 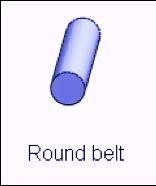 This belt has higher strength than rubber belt. These are the main types of transmission belts used in industries and material used to manufacture belts. If you got any query, put in comment box. If you like this article, don’t forget to share it on social networks. Subscribe our website for more informative articles. Thanks for reading it.